This week in our series, we continue the story of the presidency of Ronald Reagan. Soon after his presidency began, there was an attempt on his life. A gunman shot President Reagan in March nineteen eighty-one. Doctors removed the bullet. He rested, regained his strength and returned to the White House in twelve days. The new president wanted to reduce the size of the federal government. He and other conservative Republicans wanted less government interference in the lives of Americans. President Reagan won congressional approval for his plan to reduce income tax rates. Many Americans welcomed the plan. Others were concerned about its effects on the national debt. They saw taxes go down while defense spending went up. To save money, the Reagan administration decided to cut spending for some social programs. This pleased conservatives. Liberals, however, said it limited poor peoples' chances for good housing, health care, and education. President Reagan also had to make decisions about using military force in other countries. In nineteen eighty-three, he sent Marines to Lebanon. They joined other peacekeeping troops to help stop fighting among competing groups. On October twenty-third, a truck carrying explosives bombed Marine housing at Beirut International Airport. RONALD REAGAN: "There was nothing in its appearance to suggest it was any different than the trucks or cars that were normally seen on and around the airport. But this one was different. At the wheel was a young man on a suicide mission. "The truck carried some two thousand pounds of explosives, but there was no way our Marine guards could know this. Their first warning that something was wrong came when the truck crashed through a series of barriers. The guards opened fire, but it was too late. The truck smashed through the doors of the headquarters building in which our marines were sleeping and instantly exploded." Two hundred forty-one Americans were killed. Two days later, Marines led an invasion of the Caribbean island nation of Grenada. Communist forces were rebelling against the government there. Cuban soldiers were guarding the streets. President Reagan said he feared for the safety of American students at a medical school in Grenada. He sent the Marines to get them out safely. The Marines quickly defeated the communist forces. Many Americans were pleased. Others were angry. They said Grenada was invaded only to make people forget about what happened in Lebanon. The next year, nineteen eighty-four, was a presidential election year. It looked like no one could stop President Reagan. His warm way with people had made him hugely popular. He gained support with the military victory in Grenada. And, by the time the campaign started, inflation was under control. The Republican Party renominated Ronald Reagan for president and George Bush for vice president. There were several candidates for the Democratic Party's nomination. One was the first African-American to seek the presidency, Jesse Jackson. He was a Protestant clergyman and a longtime human rights activist. The candidate who finally won the nomination was Walter Mondale. He had been a senator and had served as vice president under President Jimmy Carter. The vice presidential candidate was Congresswoman Geraldine Ferraro. It was the first time a major party in the United States had nominated a woman for national office. 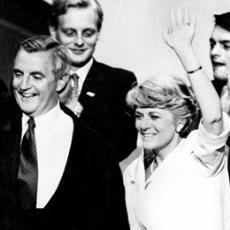 GERALDINE FERRARO: "Tonight, the daughter of working Americans tells all Americans that the future is within our reach if we're willing to reach for it. [Applause]"
One issue in the election campaign was taxes. Political candidates often try to avoid talking about taxes with voters. But former Vice President Mondale did talk about the issue. He said taxes would have to be raised to pay for new government programs. WALTER MONDALE: "The American people will have to pay Mr. Reagan's bills. The budget will be squeezed. Taxes will go up. And anyone who says they won't is not telling the truth to the American people." This was a serious political mistake. President Reagan gained even more support as a result. The two candidates agreed to debate on television. During one debate, President Reagan looked old and tired. He did not seem sure of his answers. Yet his popularity was not damaged. On Election Day, he won fifty-nine percent of the popular vote. On Inauguration Day, the weather was bitterly cold in Washington. All inaugural activities, including the swearing-in ceremony, were held inside. President Reagan's first term began with an attempt on his life. Six months after his second term began, he faced another threat. Doctors discovered and removed a large growth from his colon. The growth was cancerous. The president was seventy-four years old. Yet, once again, he quickly regained his strength and returned to work. For years, the United States had accused Libyan leader Muammar Gadhafi of supporting international terrorist groups. It said he provided them with weapons and a safe place for their headquarters. In January nineteen eighty-six, the United States announced economic actions against Libya. Then it began military training exercises near the Libyan coast. Libya said the Americans were violating its territory and fired missiles at them. The Americans fired back, sinking two ships. On April fifth, a bomb destroyed a dance club in West Berlin. An American soldier and another person were killed. The United States said Libya was responsible. President Reagan ordered a bombing raid on the Libyan cities of Tripoli and Benghazi. Muammar Gadhafi escaped unharmed but said his adopted daughter was killed. Some Americans said the raid was cruel. Others praised it. President Reagan said the United States did what it had to do. The president also wanted to intervene in Nicaragua. About fifteen thousand rebel troops, called contras, were fighting the country's communist government. President Reagan asked for military aid for the contras. Congress rejected the request. In fact, it banned all aid to the contras. At that same time, Muslim extremists in Lebanon seized several Americans. The Reagan administration looked for ways to gain the release of the hostages. It decided to sell missiles and missile parts to Iran in exchange for Iran's help. After the sale, Iran told the extremists in Lebanon to release a few American hostages. Not long after, serious charges became public. Reports said that money from the sale of arms to Iran was used to aid the contra rebels in Nicaragua. Several members of the Reagan administration resigned. It appeared that some had violated the law. President Reagan said he regretted what had happened. But he said he had not known about it. Investigations and court trials of those involved continued into the nineteen nineties. Several people were found guilty of illegal activities or of lying to Congress. No one went to jail. Most Americans did not blame the president for the actions of others in his administration. They still supported him and his policies. They especially supported his efforts to deal with the Soviet Union. 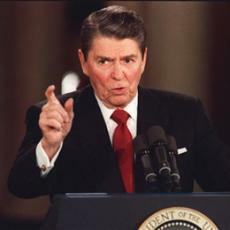 At the beginning of his first term, President Reagan called the Soviet Union an "evil empire." To protect the United States against the Soviets, he increased military spending to the highest level in American history. Then, in nineteen eighty-five, Mikhail Gorbachev became the leader of the Soviet Union. 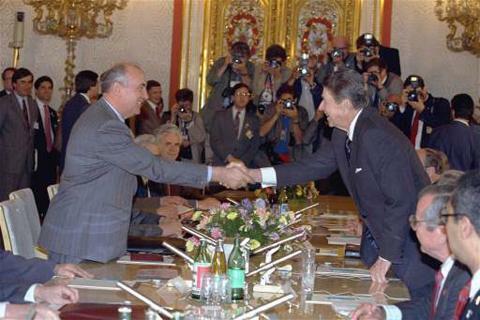 Reagan and Gorbachev held four summit meetings, in Geneva, Switzerland; Reykjavic, Iceland; Washington and Moscow. Each leader agreed to destroy hundreds of nuclear missiles. 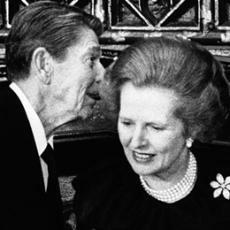 President Reagan also urged General Secretary Gorbachev to become more democratic. He spoke about the Berlin Wall, which communists had built to prevent citizens from crossing between East and West Berlin. RONALD REAGAN: "General Secretary Gorbachev, if you seek peace, if you seek prosperity for the Soviet Union and eastern Europe, if you seek liberalization, come here to this gate. Mr. Gorbachev, open this gate. [Cheering] Mr. Gorbachev, tear down this wall." [Cheering]"
About this time, a new sense of glasnost, or openness, was beginning in the Soviet Union. It was also a time of perestroika, or restructuring. The American economy grew rapidly during Ronald Reagan's presidency. Yet, at the end of his presidency, many Americans were concerned by what he left behind. Increased military spending, together with tax cuts, had made the national debt huge. The United States owed thousands of millions of dollars. The debt would be a political issue for presidents to come. Yet, Ronald Reagan will be remembered as one of America's most popular presidents. Above his burial place at the Reagan Library in California are these words, which speak to Reagan's belief in humanity: "I know in my heart that man is good, that what is right will always eventually triumph, and there is purpose and worth to each and every life." Next week in our series, we'll look at life in the United States in the nineteen seventies and eighties. This was program #224. For earlier programs, type "Making of a Nation" in quotation marks in the search box at the top of the page.